This cocktail combines a lot of my favorite elements in a really well-balanced way, and has enough wintery, holiday-ish flavors to be at home at any holiday soireé. I liked this one because it’s familiar enough for me to know that it sounds good, but introduces a new-to-me ingredient belonging to the beguiling world of Amaro. Amaro is a bitter Italian digestif full of herbs and sweetness that can be drunk neat with a wedge of citrus after dinner, but also plays a welcome role in many cocktails these days. Bartenders love Amaro because the bitter note provides balance and helps keep a cocktail from becoming too sweet, while the sweet, herbal side smooths out the heat from the base booze and leaves a nice sweet treat on the lips. Nocino, I admit, can over-sweeten a cocktail, so I love the addition of Amaro to balance that out with some bitterness. Amaro is made by many different companies, each of which has a different proprietary recipe and therefore a slightly unique taste. 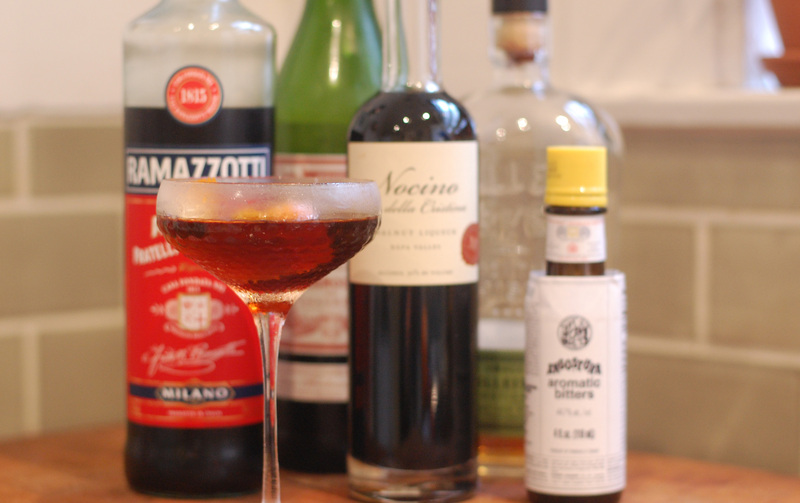 Averna is one that a lot of people are familiar with, but this recipe calls for Amaro Ramazzotti, a dark and bittersweet concoction that is less bitter than some, with a nice vanilla-y, marshmallow-y flavor. This recipe is straight from Chowhound, inspired by a cocktail originally found at the Alembic in San Francisco. I usually tweak a recipe a little bit to make it to my taste, but this one is pretty great just as it is (though if you REALLY wanted to tweak, you could sub some orange bitters in for some of the angostura). Add all ingredients to a glass filled with ice, and stir until well-chilled. This is a spirits-based cocktail, with no citrus juice, so you stir, not shake (shaking would aerate it and basically just ruin it. Don’t do it). Strain into a chilled cocktail glass. I garnished mine with a wide slice of orange peel, because I think the orange adds a nice uplifting note. Where does one get Nocino in, say, the Bay Area? Nocino can generally be found at better liquor stores, like Cask (SF and Oakland), Alchemy (Oakland), Buckingham (Oakland), or K&L Wine (SF). Cask can also ship it.